Four Mile Run Farmers and Artisans Market: 4MRMarket Report: Return of the Entrepreneurs. 4MRMarket Report: Return of the Entrepreneurs. Montoya Farms has the fruits of the Harvest. Captain Xans will be back with more of the Alaskan salmon he caught this Summer. A great way to start the week. Savory n' Sweet has apples pie pockets, plum and goat cheese tarts fresh from the oven, and the savory and sweet rolls Kremena remembers from her Bulgarian childhood. Candace Linn has Fall candles. And Bagel Uprising will back after recovering from Art on the Avenue. Look for them this week and future Sundays. 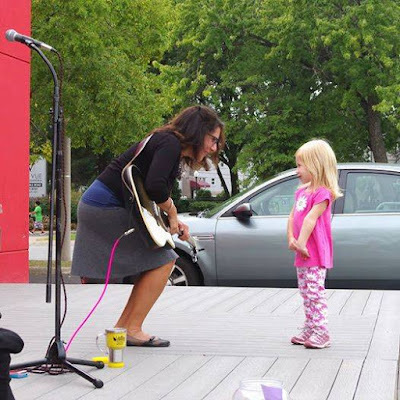 The 4MRMarket Stage will be play host to a great local talent: Janna Audey!! See her at 10am! Janna performs a mix of her own material and adaptations of songs by her favorite artists and songwriters. Whether you see Janna by her lonesome for an intimate, storytelling show, as the duo alongside husband and electric guitarist, Rob Santos you'll understand what the Janna-buzz is all about. It's about the music, providing a sense of community, connection, feeling, laughter, positive energy, and FUN.